Author(s): Ruth Keary, Marta Sanz-Gaitero, Mark J. van Raaij, Jim O’ Mahony, Mark Fenton, Olivia McAuliffe, Colin Hill, R. Paul Ross, Aidan Coffey. Centre for Research in Advanced Therapeutic Engineering, Cork Institute of Technology, Bishopstown, Cork, Ireland. Staphylococcus aureus is a major cause of infection in humans and animals, causing a wide variety of diseases, from local inflammations to fatal sepsis. The bacterium is commonly multi-drug resistant and thus many front-line antibiotics have been rendered ineffective for treating such infections. Research on murein/peptidoglycan hydrolases, derived from bacterial viruses (bacteriophages), has demonstrated that such proteins are attractive candidates for development as novel antibacterial agents for combatting Gram-positive pathogens. Here we review the research produced to-date on the bacteriophage-derived CHAPK murein peptidase. Initially, we sequenced and annotated the genome of anti-staphylococcal bacteriophage K and cloned the gene for the bacteriophage endolysin, a murein hydrolase which plays a role in cell killing during the bacteriophage life cycle. An highly active domain of the enzyme, a cysteine, histidine-dependent amido hydrolase/peptidase (CHAPK), was cloned, overexpressed in E. coli and purified. This CHAPK enzyme was demonstrated to rapidly lyse several strains of methicillin resistant S. aureus and both disrupted and prevented the formation of a staphylococcal biofilm. The staphylolytic activity of the peptidase was demonstrated in vivo using a mouse model, without adverse effects on the animals. The crystal structure of the enzyme was elucidated, revealing a calcium ion close to the active site. Site-directed mutagenesis indicated that this calcium ion is involved in the catalytic mechanism of the enzyme. The crystal structure of this enzyme is a valuable source of information for efficient engineering of this and similar CHAP-domain-containing proteins. Overall, the data collected to date on CHAPK has demonstrated its strong potential as a novel therapeutic candidate for treatment of staphylococcal infections and has provided us with insight into the fundamental enzymatic mechanisms of CHAP domaincontaining peptidoglycan hydrolases. Keywords: Bacteriophage, CHAP Domain, Endolysin, Murein/peptidoglycan hydrolase, Staphylococcus aureus. Affiliation:Centre for Research in Advanced Therapeutic Engineering, Cork Institute of Technology, Bishopstown, Cork, Ireland. Keywords:Bacteriophage, CHAP Domain, Endolysin, Murein/peptidoglycan hydrolase, Staphylococcus aureus. Abstract:Staphylococcus aureus is a major cause of infection in humans and animals, causing a wide variety of diseases, from local inflammations to fatal sepsis. The bacterium is commonly multi-drug resistant and thus many front-line antibiotics have been rendered ineffective for treating such infections. 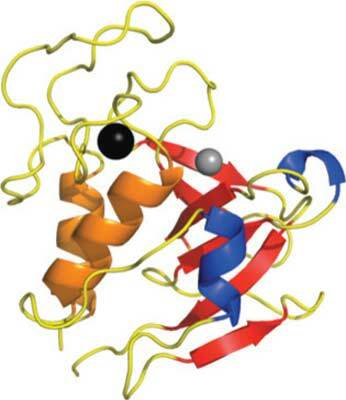 Research on murein/peptidoglycan hydrolases, derived from bacterial viruses (bacteriophages), has demonstrated that such proteins are attractive candidates for development as novel antibacterial agents for combatting Gram-positive pathogens. Here we review the research produced to-date on the bacteriophage-derived CHAPK murein peptidase. Initially, we sequenced and annotated the genome of anti-staphylococcal bacteriophage K and cloned the gene for the bacteriophage endolysin, a murein hydrolase which plays a role in cell killing during the bacteriophage life cycle. An highly active domain of the enzyme, a cysteine, histidine-dependent amido hydrolase/peptidase (CHAPK), was cloned, overexpressed in E. coli and purified. This CHAPK enzyme was demonstrated to rapidly lyse several strains of methicillin resistant S. aureus and both disrupted and prevented the formation of a staphylococcal biofilm. The staphylolytic activity of the peptidase was demonstrated in vivo using a mouse model, without adverse effects on the animals. The crystal structure of the enzyme was elucidated, revealing a calcium ion close to the active site. Site-directed mutagenesis indicated that this calcium ion is involved in the catalytic mechanism of the enzyme. The crystal structure of this enzyme is a valuable source of information for efficient engineering of this and similar CHAP-domain-containing proteins. Overall, the data collected to date on CHAPK has demonstrated its strong potential as a novel therapeutic candidate for treatment of staphylococcal infections and has provided us with insight into the fundamental enzymatic mechanisms of CHAP domaincontaining peptidoglycan hydrolases.